The Bible tells us to hide the Word of God in our hearts, but how do we memorize it? 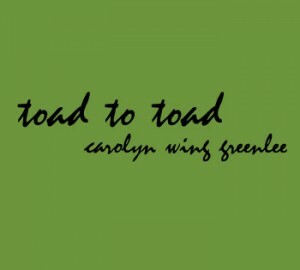 The easiest way is to sing it. These particular passages are not worship. They were chosen to feed, guide, encourage, and strengthen Believers as they battle their way through the trials of life. 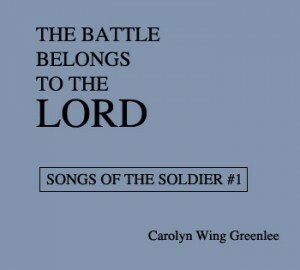 In 1978, when Scripture choruses were just being sung and worship had not yet become more popular than Contemporary Christian music, Carolyn was given a commission to put into song Scriptures that would encourage and uplift followers of Jesus Christ as they battled through the trials of their lives. 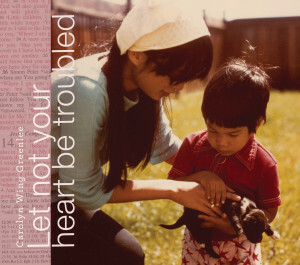 The songs on this original album, recorded in 1990, were chosen to encourage a missionary who had labored 25 years to bring the message of hope and redemption to people in China. Sometimes we just aren’t cheerful. And those that are get on our nerves. Sometimes we just feel like flops in every area of our lives. I do—a lot. 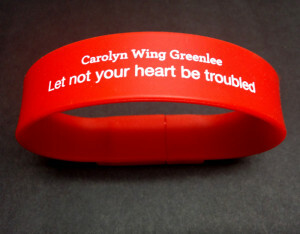 This USB Flash drive wristband has the full album in both MP3 and WAV formats, the 8-page booklet PDF, the front and back covers and all the photos. These are Scriptures set in song to help us live with courage, purpose, peace, and joy as we remember God’s words of comfort, edification, exhortation, and love. The download contains the complete album in MP3 format, the 8-page booklet PDF, front and back covers and all the photos. These are Scripture songs to help us live with courage, purpose, peace, and joy as we remember God’s words of comfort, edification, exhortation, and love.